Well I don't mind saying that this has been a shocker of a month. I can't remember such a destructive period for a number of years but such is the risk of being fully invested and not using hard stop-losses. It's not that I'm unaware of the use of stop-losses, and I do use alerts to pick up on sharp falls, but I've come to realise that they don't really work with either my strategy or my psychology. Instead I'm looking for companies which should grow and prosper over the next 5-10 years and I'm willing to endure capital volatility along the way (since I don't intend to draw-down on this capital for 10+ years). If a profit warning comes along then I'll close a position without hesitation but beyond that I'm looking to remain invested in my holdings. Obviously this tactic looks a bit silly right now, especially when a good number of folk are tweeting about how they presciently sold everything and went to cash in the summer but you can't win them all. Well the board at Burford employed outstanding timing at the start of the month by raising $250m from institutional investors at 1850p. When the price fell to this level the day after I figured that with the price at £20 just a few days before this was a good chance for me to top-up at more or less the equity raise level. In hindsight this was remarkably poor timing in the short-term; in the long-term I am absolutely sure that Burford will continue to deliver outstanding results and that the forecast P/E of ~17 will prove to be materially wrong. My reasoning here is that Burford has been employing ever increasing amounts of capital and that the profits this year are down to investments made several years ago (which is how it works every year). So their market is growing and Burford have an ever larger portfolio of cases in progress. Hence I made a second top-up recently to benefit in some way from recent volatility. 18 heads in a row has the same probability as the other 262,143 outcomes. Which means that you have a 99.9996% probability of not getting that result. And it's only that result (and its diametric opposite, 18 tails, that really matters here). We know that the chances of 18 heads/tails in 18 tosses occurring at random are vanishingly small, but we also know that there's another way of 18 heads/tails occurring that's not random at all - that the game is rigged. And, we know that the chances of any other specific combination of heads and tails occurring is also vanishingly small but we also know that if not every result is heads (or tails) then the chances of this being rigged are small, because there's some randomness. So, in the real world, if 18 heads occur in 18 coin tosses it's a reasonable inference that it's a rigged game. Frequentist: assuming a fair coin, the chance that the next toss is heads is 50% regardless of past history. Bayesian: I've never seen a tail yet, so the best estimate I can make of the next toss is another head. Love the cartoon, but more than that, I love the detailed serious explanations and commentary that follow. So to cut to the chase and coming back to the midterms S&P 500 historical observations, would you bet, say 10% of your portfolio, on the run continuing in 2018? All hypothetical of course. It's the Taleb turkey effect - we can't infer outcomes from historical data. I'm primarily a UK based investor and even if the mid-term effect does apply to the UK (I've no idea, I haven't checked) I think we have a rather more serious issue closer to home that will determine the direction of the market over the next nine months. Worth perhaps pointing out that risk tolerance changes with situation. A decade ago I'd have been about 80/20 invested in equities/gilts at this point. But a decade ago I was significantly poorer and much further away from retirement, children getting married, the dog needing a new hip and my parents going mad(der). Invest to live, don't live to invest. If you can't spend the bloody stuff what's the point? Anyway, long Gold and US Treasuries isn't a bad move - two of the best performing asset classes in the last 5 major crashes. Although Managed Futures was the best, and I'm not sure that's a rabbit hole I want to go down. Worth perhaps pointing out that risk tolerance changes with situation. Yes, agreed. Tolerance to risk completely depends on your situation. This is why I can't understand why anyone would bother declaring on social media to people they don't know that they are 100% cash etc. Because without the context of their own life situation it is totally meaningless, and let's face it, there's more than enough meaningless information out there already! A decade ago I'd have been about 80/20 invested in equities/gilts at this point. But a decade ago I was significantly poorer and much further away from retirement, children getting married, the dog needing a new hip and my parents going mad(der). Invest to live, don't live to invest. If you can't spend the bloody stuff what's the point? I dont think (hope) the figures are falsified but I would agree that it would be helpful if we could in future have the like for like on a reported basis rather than on a CC basis i.e. a much clearer picture of the contribution of the acquisitions. On a brighter note if the reported net profit contributions from the acquisitions reported at H1 are correct then their margins are as good as or better than the preexisting XPP business. Insofar as your comments on cashflow are concerned I guess it depends where your tolerance lies. Over the last 6 years i.e. excluding H1 2018 I calculate that OCF averaged 93% of operating profit - not stellar but satisfactory, whilst FCF covered dividends paid by 1.5 times which is OK for me. Insofar as valuation is concerned one of the things I look at is Stocko's P/PCF ratio. I look for 20 or lower (the median of the whole market is 19). XPPs TTM number is 32 but this includes a (hopefully) one off strategic inventory build by XPP in H1 2018 so I am using the 2017 FCF number which yields 24.9. Still a little higher than I would prefer. As I've noted on Stocko recently, XP Power (LON:XPP) is incorporated and domiciled in Singapore, although they voluntarily follow the UK Corporate Governance Code. The UK listing, as far as can tell, is historic, because the original company was UK domiciled before they switched to Singapore in 2007, which is where they saw future growth. Whether it's relevant or not Singapore has recently announced a new Corporate Governance Code after a spate of scandals - Trek2000 International, YuuZoo Corp, Midas Holdings, Raffles United, Declout, Noble and Keppel have all had real or alleged issues. I wouldn't really expect that to read across to XPP, but it doesn't seem to be generally recognised that they're not really a UK company. "Amateurs allow outside opinions and noise to influence them to break their discipline. Pros stick to a well thought out plan and only make major changes based on their underlying strategy. Having a plan is of no use unless you exercise discipline and adhere to it." "We added 35 names to our Buy Alert list this week. Today, most of those stocks are ripping higher with the market. This is encouraging." Looks like it's safe to go back in ? Not sure Mark Minervini has the 'midas touch ' anymore? After all, the Nasdaq-100 today closed over 9% higher than its recent intra-day low (Oct 29th).. and NOW he's calling the bottom?! Like Taleb, I don't think Minervini is prescient enough to call every market turn. First, many thanks for sharing your thoughts and workings on XP Power (LON:XPP) ; they are most definitely appreciated. Your workings seems to be missing Comdel revenues in Q4 2017. Please see my previous post for this figure. 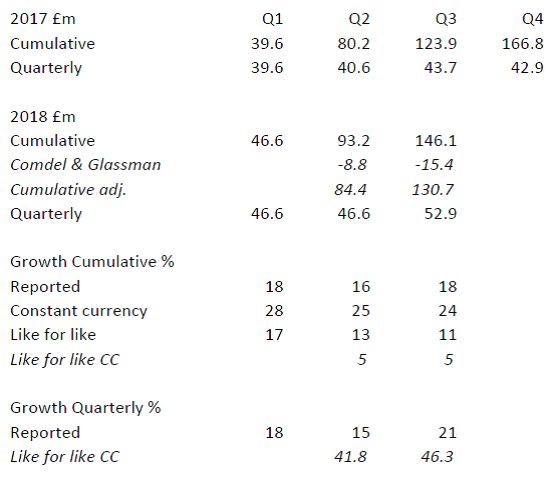 Q4 organic revenue should be c.£38.9m, not £42.9m - a MATERIAL unexplained difference. I remember Graham N also mentioning that I wasn't factoring currency headwinds. I actually think I am. If you look at GDPUSD over the last 2 years, yes it has fluctuated a lot, but not in one direction. XP Power (LON:XPP) reports always seems to carry a negative currency impact. That just doesn't conform to the actual FX rates, so either they're playing with figures or I'm missing something about their currency exposure (perhaps a hedging policy?). P/FCF. Just a side point, but I couldn't see the 19 market average you referred to. I see 16.9. I actually agree on having a target between 15-20 P/FCF (less dividends), but this is usually my sell signal as I think full value has been reached. Just to caveat that I can't say I always follow this rule. This is more of a general point to anyone who makes it down this far - I never understand investors who say they are long-term investors and will hold forever. If XP Power (LON:XPP) was worth £1bn right now would you really want to hold it, especially with its current growth rate of dividends, and revenues? Perhaps I'm wrong, but I have found in my relatively short investing life that it is more prudent to have a sell point, no matter how much I love a share. Yes, I had noticed these recent tweets from Minervini. My mentor? OK. Don't mind being associated with him in that manner. After all, following his method I notched up +39% in calendar year 2017, and my portfolio performance year to date, including the October correction, is +8%. It's results that matter. And as long as I beat the indices handsomely, he will continue to be my "mentor". Is it safe to go back in? IMO, tentatively, yes. As I blogged elsewhere a few days back, I have gone long with a few shares, but restricting the buys to large caps and liquid stocks. I have purchased a few more shares today. Total 30% of my portfolio. However I will continue to monitor events and listen to what Minervini has to say. There is only one person on earth whose ego is so large as to make such a claim. Donald Trump. 2 I briefly scanned GBP/USD for the 4 dates corresponding to the period H2 2016 through to H1 2018 which were 1.22, 1.29, 1.35 and 1.32. Sterling strengthened fairly steadily against the dollar during the 12 months to April 2018 before falling back. Although XPP didnt explicitly state it they benefitted from currency tailwinds in H1 2017 when the reported increase was greater than increase at CER (GBP/USD rate moved from 1.22 to 1.29) and the same for FY 2017 (rate moved from 1.22 to 1.35) and then reported that they faced a currency headwind in H1 2018 (rate moved from 1.35 to 1.32). Obviously difficult to corroborate exactly but the broad movements look correct to me. All they seem to be guilty of here is commenting on the currency movements when they are against them but not vica versa. 4 Fair comment. Although I am a buy and hold investor I agree that there is no point holding on if the market places a silly value on the future flow of dividends of a particular company. At this point you can sell and reinvest the capital at a better risk adjusted return (that's the theory anyway!) I sold XPP last year when the trailing PE reached 30. 1) If you do get a chance to look at that odd quarter-on-quarter movement, and find out I'm looking at the numbers wrong, please do let me know. We had a useful discussion back in October about the fact that in every U.S. 'Mid-term Year' since World War II, the S&P 500 had risen without fail between its October low & year-end close. Well, another shoe has dropped. In 2018, for the first time since WWII and in a mid-term year, the S&P 500 has closed at year-end below the October low.